What is wrong with English soccer players, their clubs and the people who run them? And what about British television channels? Don't they know anything? Any American could have explained to Wayne Rooney and his club Manchester United how to do this right. For the past week or so we have had daily press reports about how unhappy Rooney is at United, how he would be open to playing elsewhere (Manchester City, Chelsea, Real Madrid, wherever). We've also had his manager explaining in somber tones how disappointed he is in Wayne and then exploding at the media for ... I don't know what, but just because he's Sir Alex Ferguson, soccer manager god. Mixed in to all this were the tabloid stories about Rooney's marriage, whether his wife would forgive him or not and, amazingly, one story in today's Daily Mail about how Rooney's Mother-in-law was calling the shots on where he was to play his soccer. You really had the feeling that the media frenzy hadn't yet peaked, that Rooney could be allowing the speculation to mount, generating suspense in us as if he were a Stephen Spielberg. 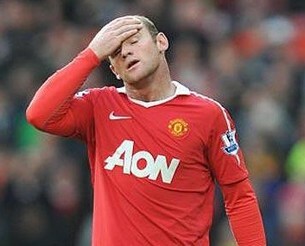 But, lunchtime today Rooney announced that he had signed a new five-year contract and was staying at United. Just like that the suspense is over and we're left with a flat feeling of having been robbed. We needed something bigger. This is where an American sports fan could have advised Rooney. Any of us would have said to him, "That's just not how it's done these days, Wayne. You don't just issue statements to the press with this sort of thing. No, no, no. 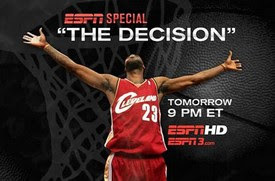 You arrange for a one hour, prime time television program where you will announce The Decision. That's how young sports stars handle these matters nowadays." It could have been great. A live audience in a small sized theater with two chairs on the stage. One for Rooney and one for an agreeable television sports personality, who would set the tone for the occasion. Heck, they could've thrown in a third chair for Rooney's Mother-in-law, which would have made Rooney's program much better than LeBron's. But no. Now we're only left with "what might have been" because Rooney didn't follow the appropriate path. He has denied his fans and really all sports fans their due. He has not made The Decision.